Premier 24" electric range with front control panel and bakeview oven window. This range also features 4 coil elements, 2 oven racks and a storage drawer. Additional Information 10" tempered glass backguard with electric TOD clock/timer, surface element signal light, 2000 watt bake element. 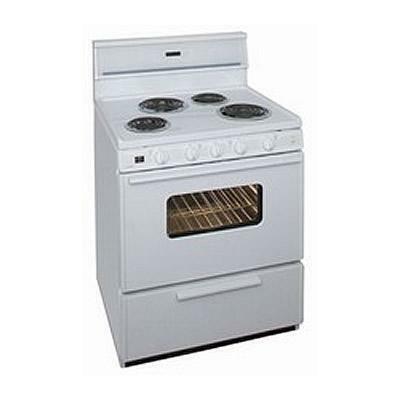 Burners/Elements Output 1-8" Element (2100w), 2-6" Elements (1250w) coil elements, 2,800 watt broil element.